The weather has not been on my side this week so I decided to take advantage of this by making a start in the greenhouse. A greenhouse or windowsill is a perfect first home for many plants, fruits and vegetables. I see my greenhouse like a cosy nest. This is where I will nurture seedlings, keep them warm, watered and once big enough, they can go out into the big wide world! Now, let’s talk Tomatoes. They come in every shape, colour, size and are a taste sensation. I think tomatoes are a brilliant fruit to grow if you are a beginner or looking to involve young children in gardening. They produce such impressive yields and are relatively low maintenance. Did I mention that if successful you wont need to buy tomatoes all summer? My personal favourites are Tomande F1, Outdoor Girl and Ildi F1. I am also a lover of the Sun Gold variety, which I will be getting my hands on later this month. I sow my seeds in small seed pots, only putting one seed in each hole. Don’t forget to label the varieties you have planted - your future self will thank you! Now these nitrogen loving plants will need to be planted in a grow bag or a large pot in April, once seedlings are established. Here at Wildbunch we supply the Levington Grow-Bag which have an excellent reputation amongst other fellow gardeners. Spinach was next on my list. I had a few incidents regarding rabbits and caterpillars last year and ended up with half eaten leafs, but I am still going to give it ago! What I love about Spinach is that you can make continuous sowings all year round as they germinate quickly. One thing to remember is that spinach does not like the summer sun and would do really well planted next to taller vegetables that can provide shade for them. Great companion plants would be sweetcorn, beans and cucumber. 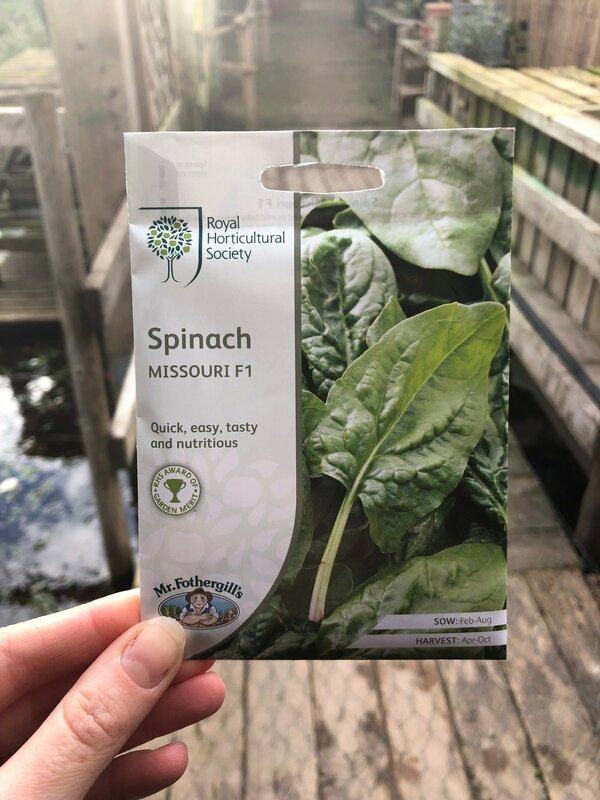 The variety that I will be growing is the RHS Spinach Missouri F1- quick, tasty and full of goodness! Get in touch today for more information on products that we sell at out Garden Centre based at the Goodlife Farm Shop Headbourne Worthy.